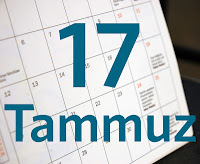 In truth, however, this period of "sadness" begins on the Fast of the 17th of Tammuz (observed today) and lasts exactly three weeks - until Tisha B’Av (the Ninth of Av), the day on which we mourn the destruction of both the First and Second Temples. While all Jewish communities mark the 17th of Tammuz by mourning and fasting, in Ashkenazic communities, this mourning continues during the rest of the month of Tammuz by refraining from haircuts and shaving, listening to music, reciting a sheh'heh'cheh'yanu blessing on new garments, and celebrating weddings. 3) Doing laundry or wearing freshly laundered clothing (except for Shabbat). It is therefore customary to choose outfits for the nine days and wear them in advance of the nine days for just a few minutes so that they are not “fresh.” Children’s clothing may be laundered as needed. This Treat was previously posted on July 15, 2014.